Early World Cup exit. Nobody wants it – but it happens to many. In Russia, favourites were dropping like flies and might continue to do so. This time though, there were many dimensions to their failures. Hours after the completion of the last Round of 16 match, it’s time to take a tour among those who’ve already packed their bags and departed from the largest country in the world. Turns out it wasn’t injured Manuel Lanzini whom Albicelestes missed the most. Nor Mauro Icardi, omitted by Jorge Sampaoli during the selection process. Nor even Paulo Dybala, allowed to play 22 minutes in Russia – exactly as many as the number of goals he’s scored in Serie A last season. No. Argentina’s fate has been sealed on 21st of May, when Sergio Romero’s right knee blew up in training, leaving his national team at the mercy of Chelsea’s Willy Caballero or Franco Armani. “Him in goal or me in it would’ve been the same because I can stop shots as well as him” – said ruthless José Mourinho after the Chelsea goalie failed to save Alfreð Finnbogason’s equalizer against Iceland. Soon enough, his comment has become even more relevant. Croatia winger Ante Rebić will forever wonder how the ball that was already in Caballero’s control suddenly flew straight into his path and that earned him a goal. But Willy knows. He tried to be fancy in his own half and it backfired. Enigmatic Sampaoli finally answered the calls for a new number one against Nigeria. In a must-win match, Franco Armani did reasonably well – though he had more luck than skill to display, as Super Eagles struggled to hit the target. However, in the knockout stages, France exposed Boca Juniors portero. Four goals conceded, not a single (!) 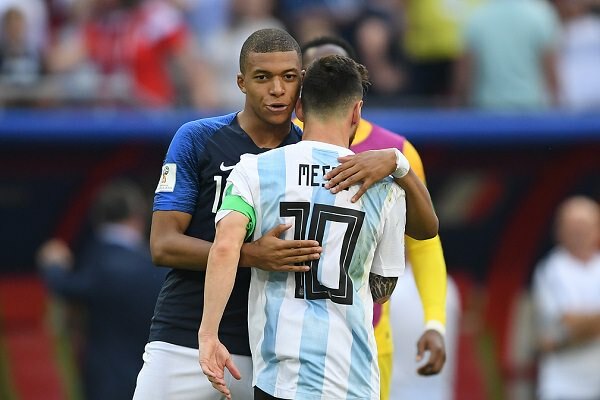 successful save and Kylian Mbappé’s critical strike that snuck in under the goalie’s leg – those factors contributed more to Argentina’s exit than poor goalscoring form of their forwards. Just glancing at the statistics without watching the games, one might think that Germany were the best team of this World Cup’s group stage. Die Mannschaft has attempted the most shots (72), created the most goalscoring chances (57) and completed second-largest number of passes (1743, only behind Spain). If only they had the chance conversion ratio of Belgium, they’d be getting out of Group F with thirteen goals; if only they were as prolific as notoriously terrible Panama, they’d be scoring seven times. Instead, they’ve only scored twice. 22-years old Timo Werner (one shot on target in 266 minutes) did not come close to matching the legacy of record-breaking veteran, Miroslav Klose. 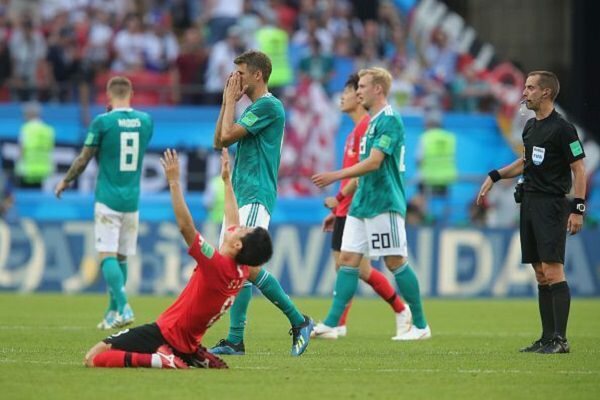 Others disappointed even more: in four years, Thomas Müller went from opening the semifinal scoreline against Brazil to getting dropped from the starting eleven against South Korea; Julian Draxler had a good second half against Mexico and that’s about it. The whole team has put 26 shots wide! Talk about wasted potential. In the end, despite a shambolic result, Joachim Löw’s head did not roll. According to his new contract, the boss recently linked with Arsenal and PSG will retain his position until 2022 and an outrageous tournament in Qatar shall see him still in charge. That way, he’ll have a rare opportunity to correct several mistakes on his part. Leroy Sané (snubbed for delivering poor performances in a German shirt) and Julian Brandt (handed only cameo appearances despite undoubtedly good form) should be the first players to benefit. Goals galore against Spain and a winner scored past Iran did not help. 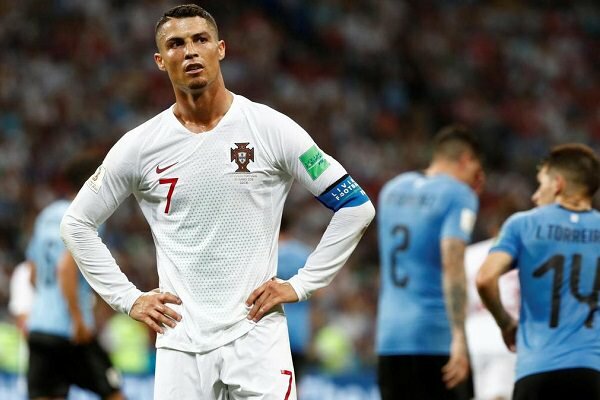 Cristiano Ronaldo, 33 and reportedly on the verge of exiting Real Madrid, failed to inspire Portugal’s success the way he did two years ago in France. Against Uruguay, a decade younger José Giménez dealt with him so effectively that his whole appearance has been reduced to long shots. And once CR7 was pushed out of the box, Lucas Torreira repeatedly showed up in front of Ballon d’Or holder to block whatever strike he would come up with. To be fair to Cristiano – his teammates did not exactly inspire him either. The man who was supposed to support him with pace and crosses, Gonçalo Guedes, has utterly disappointed, delivering merely two dribbles and two shots on target in four appearances. The same applies Bernardo Silva. After producing a stinker against Morocco, Manchester City starlet returned for the Uruguay clash but was unable to make his efforts count and La Celeste left-back, Diego Laxalt, earned himself a lot of reputation for stopping the 23-years old. Caretaker manager Fernando Hierro taking the sole responsibility despite being in charge for only two weeks. Sergio Ramos crying in front of the TV cameras. Andrés Iniesta talking about “the saddest day of his career” and announcing his international retirement. David de Gea diving the wrong way as he usually did in this tournament. 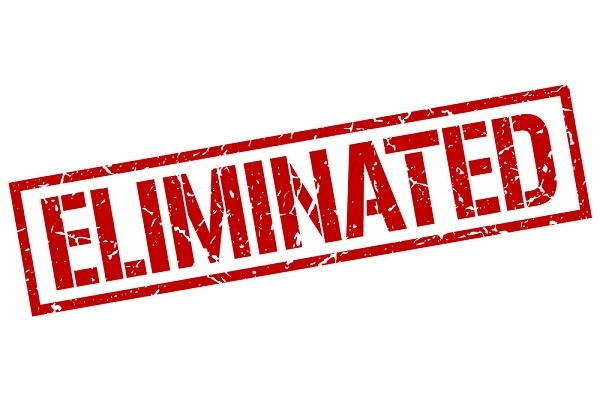 España kicked out of the competition by the hosts after 120 minutes of creative indolence. This is the landscape of their World Cup eight years after lifting the most precious trophy in football. To make things worse, the match against Russia bored the hell out of all neutral fans. Or all fans not in love with the passing-oriented football for that matter. 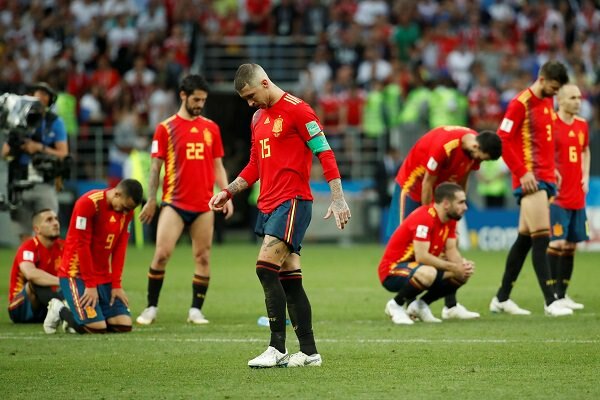 Ramos alone was responsible for only 18 accurate passes less than the entire Russian team – but where was the movement, the pace, the one-touch dynamics that would rip through the entrenched opposition? Those qualities did not come into play until the 104th minute, when Rodrigo Moreno woke up his lethargic teammates with several runs. Too little, too late. There is a silver lining to this mess, though. At home, La Furia Roja left the likes of Alonso, Bartra, Bellerín, Fàbregas, Ander Herrera, Javi Martínez and Morata. Many of them can still be useful to the team in the future, as well as those who went to Russia on a vacation: Azpilicueta, Odriozola, Saúl and Thiago. “I can safely say that we can all look each other in the eye.” – said Hierro, who remembers even worse heartbreak, suffered in 1998, in France, from the hands of Nigeria and Paraguay – “I am leaving resting easy.” – he added. “Unlucky” isn’t a strong enough adjective to describe James Rodríguez’s World Cup – but then again, no adjective is. The man who’s been scoring stupendous goals four years ago and got inexplicably dumped by Real Madrid last summer, just couldn’t catch a break. One of the last trainings before the opener against Japan cost him a calf injury. Then, just after a devastatingly good performance against Poland, his muscle problem recurred half an hour into the Senegal clash. This time, there was no timely recovery to be made. England can count themselves lucky. 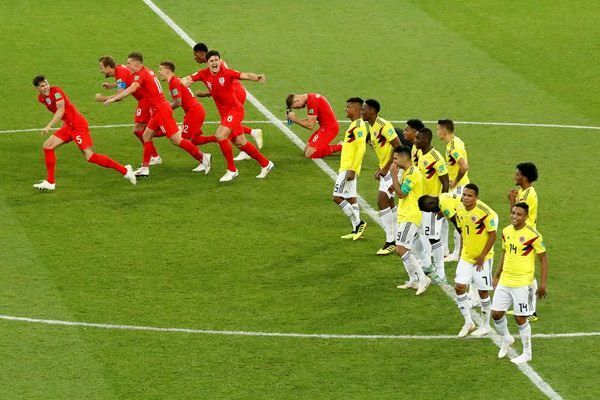 Without their leader, the Colombians were half the team we knew from the group stages and rescued themselves with a late equalizer only to drop out through the penalty shootout. Juan Quintero, who benefited the most from James’ companionship, didn’t have much to offer in several duels against Jordan Henderson and Ashley Young. Right in front of the goal, Radamel Falcao struggled to get the service and needed 91 minutes to come up with his first shot on target. José Pekerman’s lads will be deeply disappointed. Having Bacca, Cuadrado and Falcao all in their thirties already and David Ospina rapidly approaching that landmark, the generation that elevated Los Cafeteros to the 3rd place of 2013 FIFA rankings will now be slowly getting off the radar. James, who’s bound to celebrate 27th birthday in a week shall lead the descendants of the Golden Generation – but first, they need to find new firepower to balance out undoubtedly impressive, young, defensive spine. For 60 minutes of their Monday game, The Samurais were overtaking Russians in a race to be the biggest dark horses of the tournament. Disciplined, aggressive and enthusiastic, they wouldn’t let Belgium catch a breath, let alone organize a truly dangerous attacking move. In the second half, Gaku Shibasaki provided an assist worth of prime Andrea Pirlo and his team followed that up marvellously with Takashi Inui’s soon-to-be goal of the tournament. For the first time in history, an Asian team looked destined to make it to the quarterfinals. 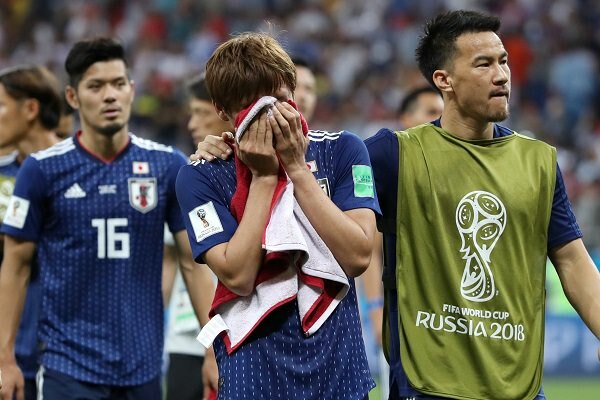 If only football matches were 20 minutes shorter… Extremely driven but not experienced enough, Akira Nishino’s men gave all they’ve got too early. Their final minutes were nothing but struggle and pain and the manager did not help his side, bringing first substitutes as late as in 81th minute. This time, the bus-parking tactic failed despite two goals in hand: Belgium, richer in quality, finally got their attacking play sorted out and Chadli’s final, victorious kick of the game was nothing but an inevitable conclusion to the course of the contest.